Back in January, I had the pleasure to review two Lew & Huey Phantom models, that you can read here, and soon after I posted the review, Chris Vail, the founder of Lew Huey told me about a new project he was working on, a completely new brand, NTH. In the same time, he also created an umbrella company called Janis Trading Co. that includes both Lew & Huey and NTH. NTH — nod to history — is paying homage to legendary timepieces from the past and the first collection, called the Subs, is mainly inspired by vintage Rolex and Tudor Submariner watches. There were eight models in this collection (the Näcken – Vintage, Black is already sold out) sharing the same 40 mm stainless steel case, crown and oyster-style bracelet. 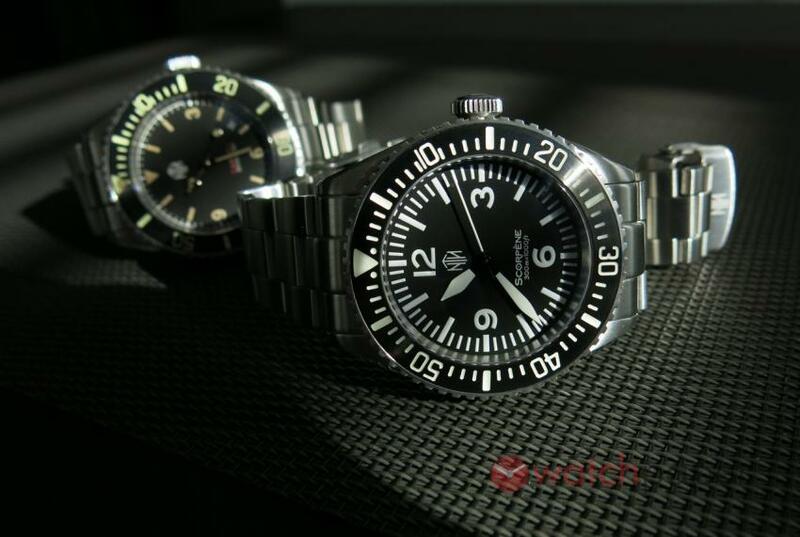 It is their bezel and dial that sets them apart offering a wide range of choices for fans of vintage tool watches. 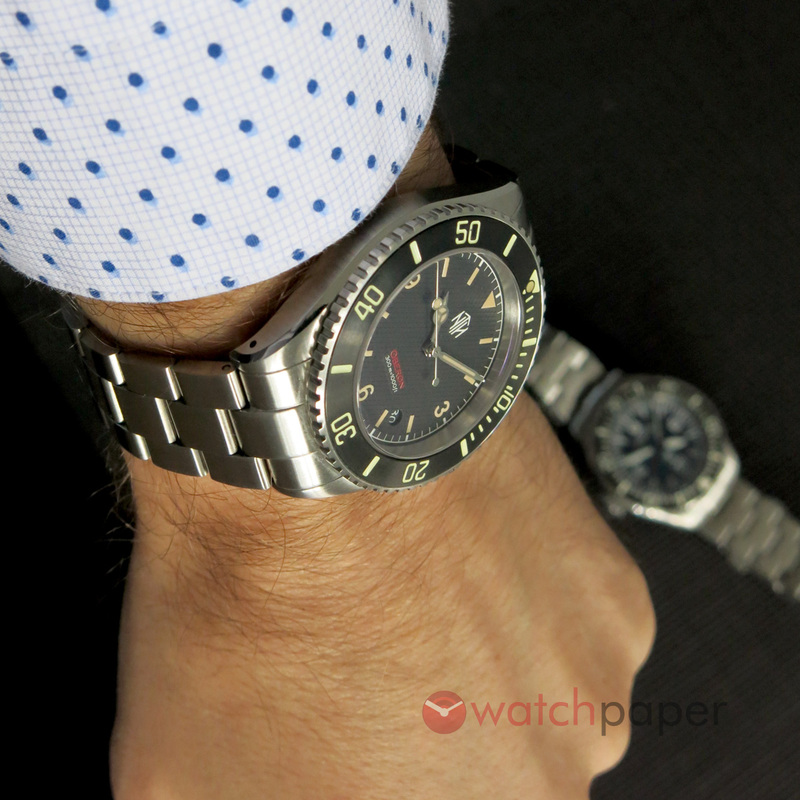 For this review, Chris sent me two very different models, the Oberon, a vintage Rolex Submariner homage and the Scorpène, the outlier of the bunch, more of a pilot style watch. The watches I received are final prototypes, 98% same as the production models, giving an accurate image of what to expect from the real deal. 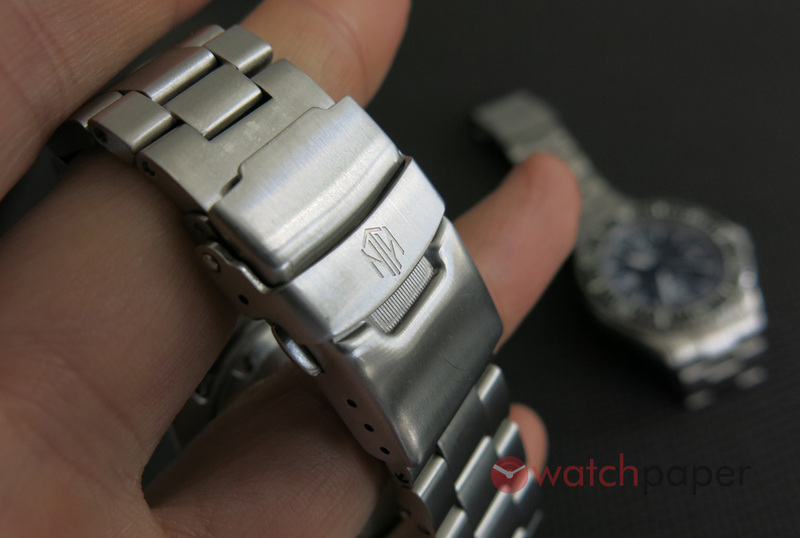 The fold-over push-button clasp bearing the NTH logo. I would usually write about the bracelet toward the end of a review, but since the first thing I did after receiving them was to adjust the bracelets to my small wrist, let’s get it out of the door right away. Adjusting a bracelet or changing a strap is probably the closest most of us gets to watchmaking and it always fills me with admiration for those who practice this craft. Adjusting the bracelet was a straightforward business and despite my small wrist, they felt really solid and comfortable at the same time. The secure feeling is reinforced also by the branded fold-over push-button clasp. The bracelet, the clasp and the case have a subtle brushed finish that gives them that solid tool-watch allure, the only polished surface is the chamfered edges of the case that nicely highlights the shape of the case and the curved lugs. The screw-down crown is very well designed, it is shaped to be easy to pull out, it offers a good grip, and despite its large size, it did not hurt my hand thanks to its narrow profile. 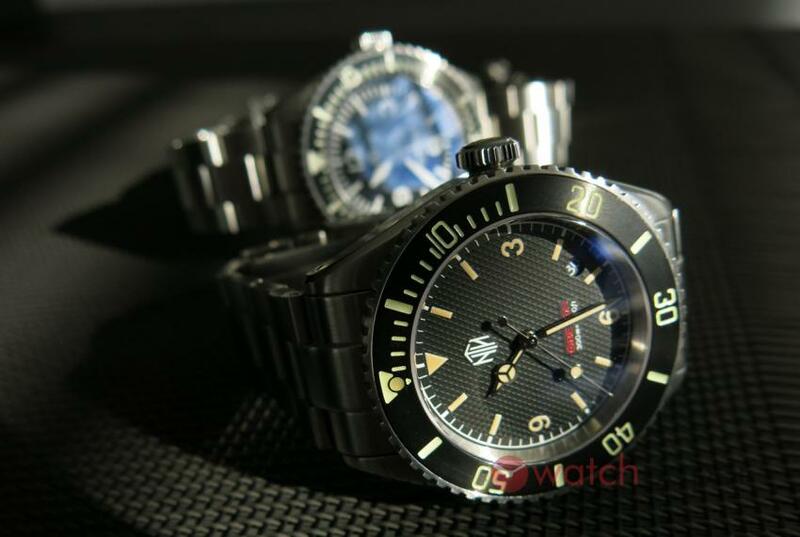 One of my favourite features of the Subs collection is the size of these watches, with their diameter of 40 mm and a lug-to-lug length of 48 mm, they are tool watches that are wearable in any situation, without feeling awkward about having a tank on your wrist. 11.5 mm thick? 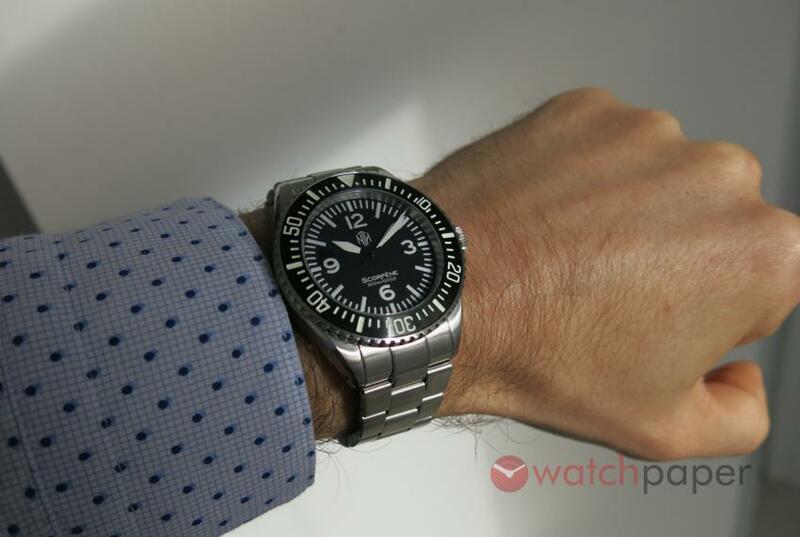 That is actually quite slim for a diver watch and thanks to the domed crystal, it will easily go under your cuff. 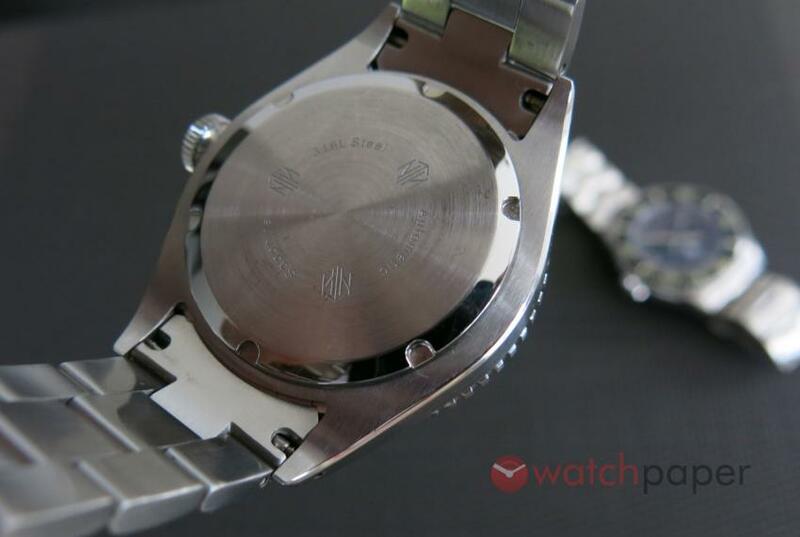 The solid back of the watch has a rather spartan look, it reminds me the watches issued by the military. 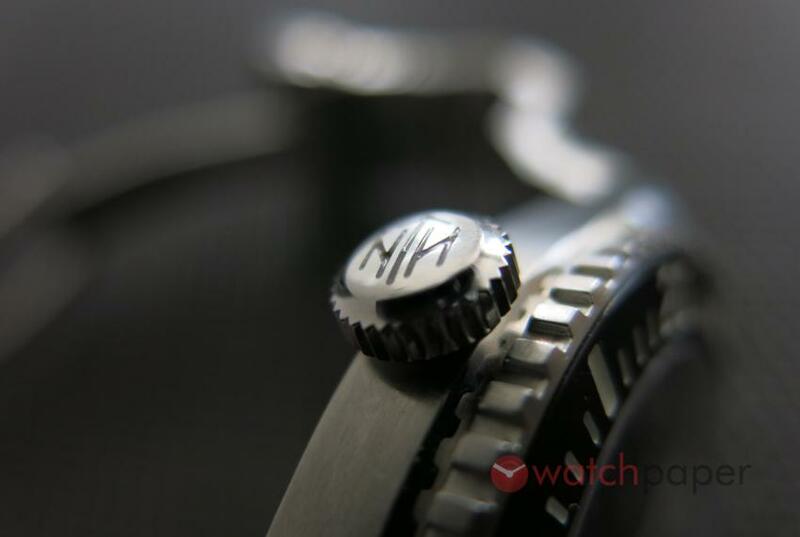 There is nothing fancy on the circular brushed cover, all you can find engraved with tiny characters is: “316L Steel, Automatic, Saphire”, with the NTH logo between them. I would have preferred it to have a distinctive element between the two models, without going overboard with an engraving, or a stamped model of the submarine after which the watch is named, but at least something to say Oberon or Scorpène would have been nice. 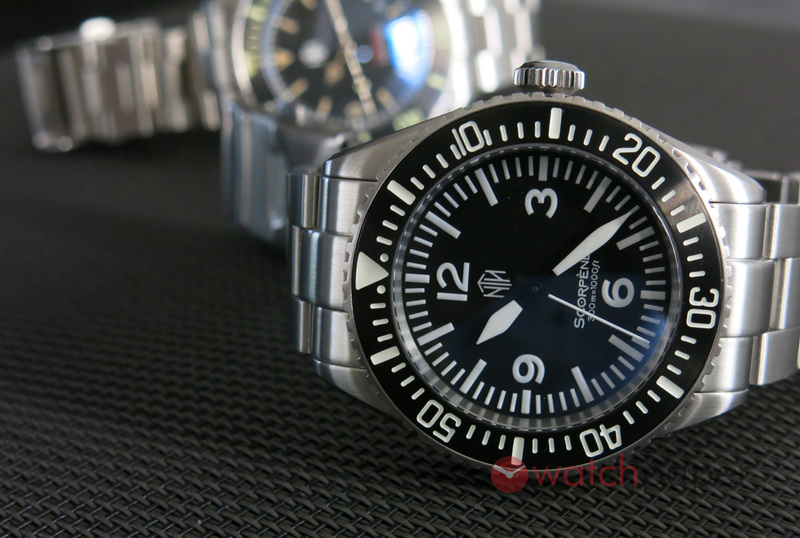 Under the lid, all NTH Subs are powered by the automatic Miyota 9015, that will run about 42 h when fully wound. While I did not go into the water with them, they are water resistant to 300 meters. So far we went through all the features that are shared by the two models, let’s now look at the differences. The Oberon is an unmistakable homage to vintage Rolex Submariner watches, the hands, even the lume-filled fonts on the bezel are the same as on a Submariner. While the look of the bezel is different on the two models, the 120-click unidirectional mechanism on both watches is really precise, they are among the best I handled from a microbrand. I’m in love with the waffle pattern of the black dial on the Oberon, it is absolutely gorgeous and it gives the watch a high-end look and it is an elegant nod to early Submariner models. The numerals, the indexes and the hands are filled with vintage lume, again the result is fantastic. While the Oberon I received has a date window between four and five o’clock, you have to know that on the Janis Trading website, you can have the choice of going with or without the date window when purchasing your watch. 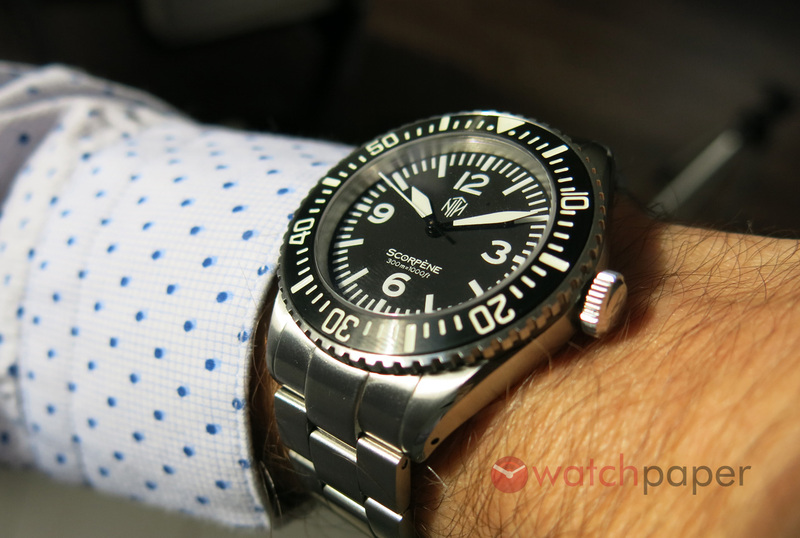 The Scorpène is an interesting model, to me, it looks like a pilot watch, and at first it felt strange that the bezel rotates only in one direction. Other than this, it is a beast, a no-nonsense tool watch with a high contrasting dial, large numerals, bold hands over a daring minute’s scale, the visibility is fantastic. 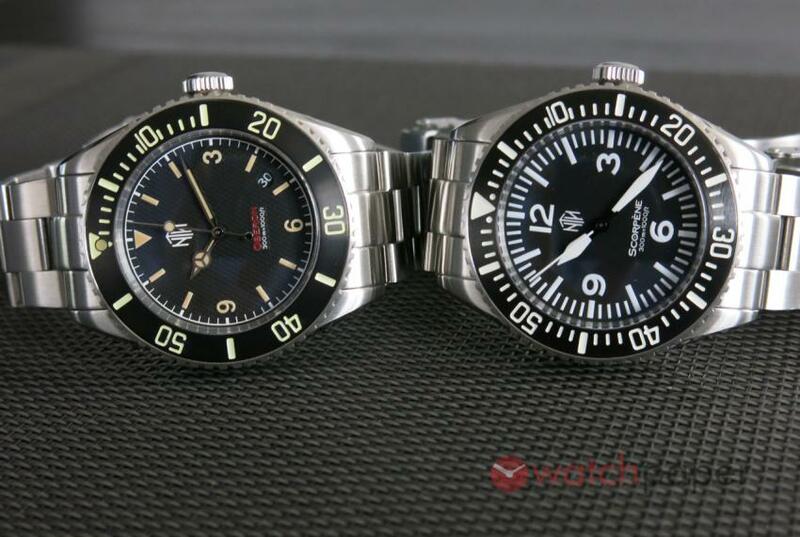 During the past weeks that I had the two watches, I found myself wearing the Scorpène more often. While I really like the Oberon, because of its wafer dial, the vintage lume, and it’s overall old-school Rolex look, the Scorpène talked to me more probably because I can’t really put my finger on a specific watch that inspired it and Chris confirmed that it follows the design of generic pilot clocks. 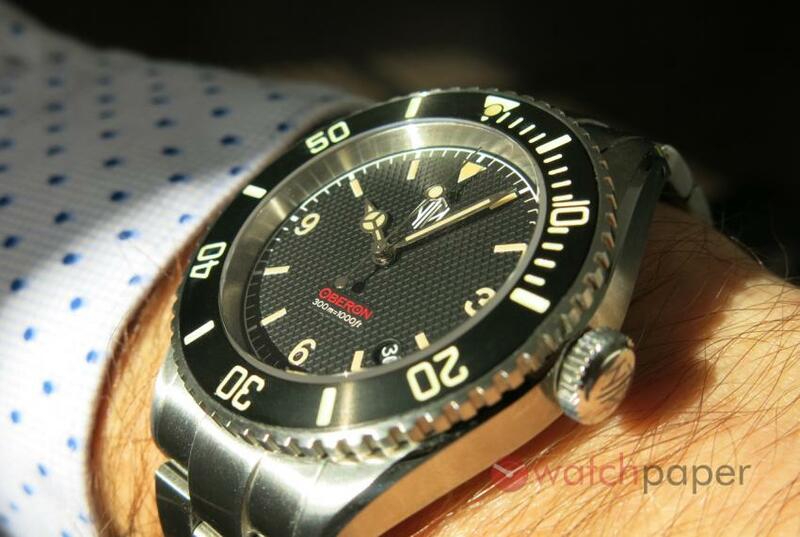 We are used with diver watches to have lume on the bezel, the hands and the dial. 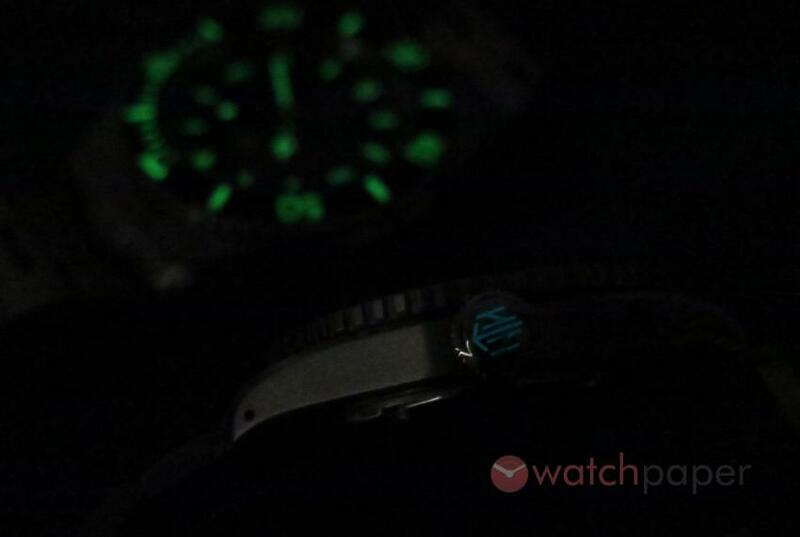 With the Subs collection, even the NTH logo on the crown has lume insert. Does it serve any purpose? No. Is it super cool? Absolutely! As you can see on the picture below, the Oberon shines in green, while the lume on the Scorpène is blue in the dark. 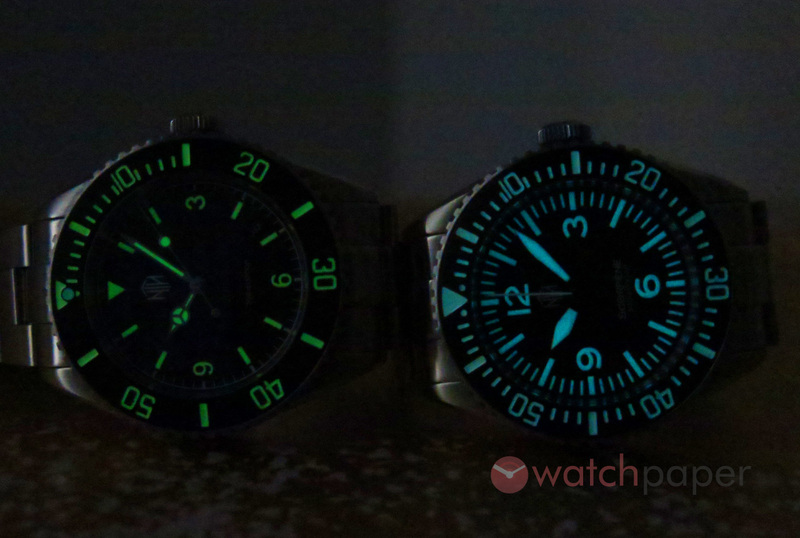 While both watches have a generous amount of lume coating and they work well in dark, when it comes to brightness, I have to give extra points to the Oberon, its lume proved to be stronger than on the Scorpène.